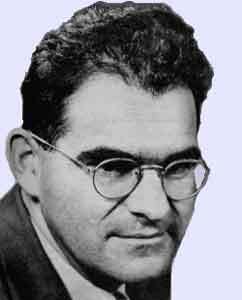 "Weisskopf dies at 93; was protégée of physicist Niels Bohr". MIT News. 24 April 2002. Retrieved 20 February 2015. "Victor Weisskopf, Group Leader - Los Alamos Theoretical Division". The Manhattan Project Heritage Preservation Association, Inc. 2005. Retrieved 20 February 2015. "War and Peace in the Nuclear Age; Weapon of Choice, The; Interview with Victor Weisskopf, 1986". openvault.wgbh.org. Retrieved 2017-06-05. Office of the Home Secretary; National Academy of Sciences (1 January 2004). Biographical Memoirs. Vol. 84. National Academies Press. p. 375. ISBN 978-0-309-08957-9. Gottfried, Kurt; Jackson, J. David (February 2003). "Mozart and Quantum Mechanics: An Appreciation of Victor Weisskopf" (PDF). Physics Today. 56 (2): 43–47. Bibcode:2003PhT....56b..43G. doi:10.1063/1.1564348. Gottfried, Kurt; Jackson, J. David. "Victor Frederick Weisskopf, 1908-2002, A Biographical Memoir" (PDF). p. 16. "I might even have shared the Nobel Prize with Lamb"
"Who's who in Cern: Victor F. Weisskopf". CERN Courier. 1 (15): 2. Winter 1960. Hine, Mervyn (January 2003). "Working with Viki at CERN". CERN Courier. Kummer, Wolfgang (June 2002). "Victor Weisskopf: looking back on a distinguished career". CERN Courier. 42 (5): 28–32. "Farewell to Professor Weisskopf". CERN Courier. 6 (1): 3–5. January 1966. "People and things". CERN Courier. 23 (10): 432. December 1983. "Public Welfare Medal Recipients". National Academy of Sciences. 2015. Retrieved 20 February 2015. "Past and Present Presidents". American Physical Society. 2015. Retrieved 20 February 2015. "Academy Presidents". American Academy of Arts & Sciences. 2015. Retrieved 20 February 2015. Carl Sagan; Hans A. Bethe; S. Chandrasekhar et.al. (January 1990). "Preserving and Cherishing the Earth". Yale Forum on Religion and Ecology. Retrieved 20 February 2015. Chang, Kenneth (2002-04-25). "Victor Weisskopf, a Manhattan Project Physicist, Dies at 93". New York Times. Retrieved 2017-06-06. "Weisskopf wins Oppenheimer Prize". Physics Today. American Institute of Physics. 36: 77. July 1983. doi:10.1063/1.2915767. Retrieved 1 March 2015. "Reply to a parliamentary question" (pdf). Österreichisches Parlament (in German). Wien. 23 April 2012. p. 1372. Retrieved 5 January 2013.